Promotional Marketing Service—provide innovative, licensed gifts and premiums to help clients with promotions. PPW offers clients a full range of first class, in-house services that allows enhanced Total Quality Management. Each of the account management functions acts as an autonomous unit to allow implementation and execution of global initiatives into regional markets. The Promotional Partners teams are committed to provide our clients with the most cost effective, imaginative and result-driven campaigns in the world. Our teams' expertise lies in strategic marketing and consultation, creative concept and development, property identification and negotiation, premium sourcing, program management and evaluation. PPW has strong in-house design departments, which can offer both creative treatments of licensed properties and a host of original characters. Our designers not only produce drawings according to each client's specific needs, but they are also capable of incorporating the right product features that will make the items attractive yet mass-production-friendly. Fully staffed and equipped studios are located in the Hong Kong, Shenzhen, Shanghai, Beijing, Manila, Bangkok and Los Angeles offices. Therefore, innovative ideas are generated internationally. This sharing of resources creates a synergy that proves to be one of Promotional Partners' major strengths. PPW evaluates programs based on client promotional objectives. We compile reports based on key learning for future programs to continue to strive for execution excellence. The engineering team at PPW has the ability to adapt new and existing ideas to meet clients' unique requirements. Moreover, we can develop proprietary designs, clay models, and tooling in-house. PPW is committed to learn and adapt the latest technology in production methods and processes. One important feature that makes us special from other agencies is that we operate our own factory, and it is no ordinary factory. To ensure the highest standards in quality and ethical business practices, PPW has invested in an ISO-certified manufacturing plant situated in Dongguan, China. Through this facility, PPW is able to service all facets of promotional merchandising requirements in-house ranging from initial concept and design, all the way to engineering, development, tooling and production. Sourcing the right premium for a campaign goes a lot further than searching through a trade directory to find the cheapest or quickest supplier. With a strong international merchandising team and ample sourcing experience in a diverse product range, PPW can find exactly what you need - which includes product development, manufacturing, and delivering the merchandise. To assure our clients' requirements are met, in-house vendor audit programs are utilized. Purchase orders only are issued to factories that pass our audit inspection criteria. Our QC inspectors travel across China and other Asian regions to perform factory audits, intervention and final inspections prior to shipments. In-house QA/QC departments with full team of QA/QC experts and testing lab are set up in both HK Headquarters and China. All team members have thorough understanding of worldwide safety standards and codes of conduct required by some of the strictest clients. Beside, customized QA/QC program is developed to meet client’s specific requirements. PPW’s global distribution network can accommodate shipments from one carton to large-scale ocean freight services. Utilizing the facilities of our worldwide network, we are able to provide fulfillment, repackaging, and warehousing. In addition, we have the experience in working with airlines to manage client airfreight requirements as needed. We also have the capacity to work with factories across Asia and other regions where products are sourced. Our experienced personnel located in regional offices across the globe provide local point of contact for handling all client inquiries and communicate the status of all shipments. 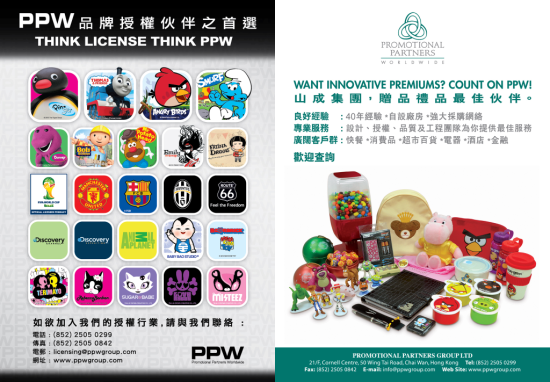 PPW has always recognized the value of international branded properties and licenses, and providing licensing agency services continues to be one of our core endeavors. Our extensive working experience with various international licensors enhances our knowledge of promoting different brands and properties all over the world. We are able to develop and execute effective licensing programs not only to capture the business opportunities and generate royalty revenue, but also be able to meet the business objectives of the licensors. PPW has extensive knowledge of the China market. Our full team of China experts in our Beijing, Shanghai, Guangzhou, Shenzhen and Quanzhou offices provides professional services and acts as a brand facilitator for our clients to develop their brands in China. The comprehensive services that we provide include identifying qualified licensees, setting up retail distribution channels and sourcing promotional partners. Branded Retailing Service—operate retail chains selling interesting cartoon characters life-style products to consumers. PPW is optimistic about the retail market in both Mainland China and Hong Kong. With continued economic and consumption growth coupled with increasing tourism arrivals, the demand on quality gifts and life-style products will increase. Against this backdrop, we have already started our investment in branded retailing in 2005. We first brought in Hello Kitty by operating several shops in Southern China and now there are over 120 Hello Kitty shops all over China. The second brand we bring in in 2012 is Angry Bird. We are going to open a flagship store selling Angry Bird life-style products in the first half of 2012. Angry Bird is a very popular icon and we are confident that consumer will like the products. Plans are in place to expand the shops to Hong Kong. Click to enter into each business.